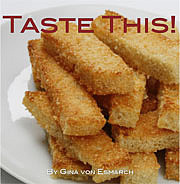 Published on November 5, 2010 in Recipes. Closed Tags: Giants World Series, Gruyère, tomato cheese tart, tomatoes, Upside Down Gruyère Tartes Tomate, vegetarian. I have struggled as to what to name this newest creation, beyond the obvious, “yummy cheese crust with seasoned tomatoes’, but that just didn’t sound flashy enough. 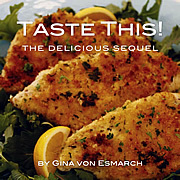 I hope the above name will inspire you to take a chance on this French-esque vegetarian recipe. I’ll confess, there was a fleeting moment when I thought I should brand this creation in honor of the World Series Champions- The San Francisco Giants -but I am certain that they feel my support despite my lack of a dedicated recipe. While the recipe reads rather long, it is because some of the ingredients are for the crust and the other ingredients are for the filling. 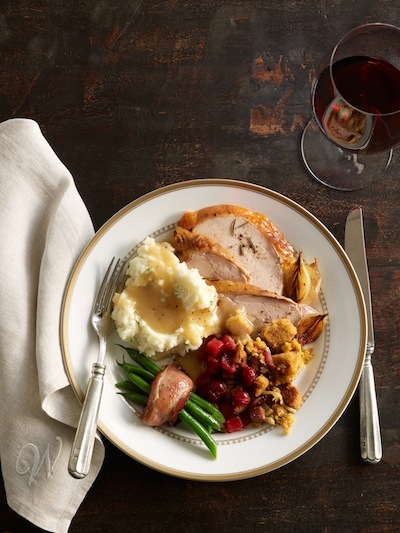 I recommend you read over the full recipe once so that you know what to anticipate on each of the steps, none of which are very complicated (shhh, your guests will never know!). The perfect accompaniment to this dish is a salad with a light balsamic vinaigrette and a glass of crisp white wine. Now for a brief PSA about Gruyère cheese: For those whom have not had the opportunity to work with Gruyère cheese, it is like Emmenthaler Swiss cheese, only slightly milder. So if you like Swiss cheese, you should like it. Depending on the age of the cheese, the flavor is sweet but slightly salty. It is often described as creamy and nutty when young, becoming with age more assertive, earthy, and complex. Shred Gruyère cheese and set aside. With machine running, pour 1/4 cup water through the ingredient tube. Use the pulse setting until dough holds together without becoming too wet or sticky. Best not to process in the machine more than 30 seconds as butter will begin to melt and change consistency. An easy way to test for the correct consistency is to squeeze a small amount together: if it does not stick but crumbles, add more water at TBS at a time. Divide dough into two equal balls. Flatten each into the shape of a disc and wrap tightly in plastic. Chill for 1 – 1 1/2 hours. Stir occasionally, until onion is translucent in color, approximately 5-8 minutes. Set aside to cool. 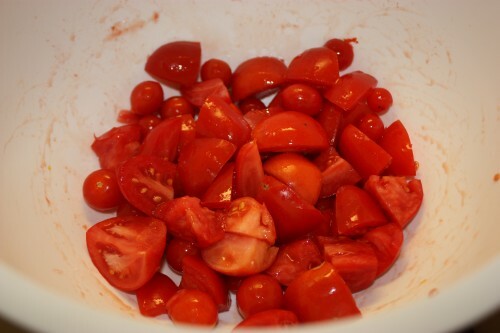 When onion mixture is cool, add to the above bowl of tomatoes. 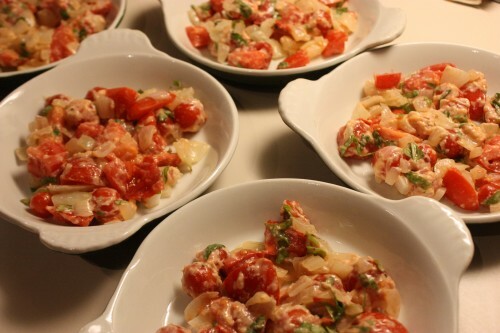 Using six individual 3-inch ceramic lipped round dishes, evenly divide tomatoes. 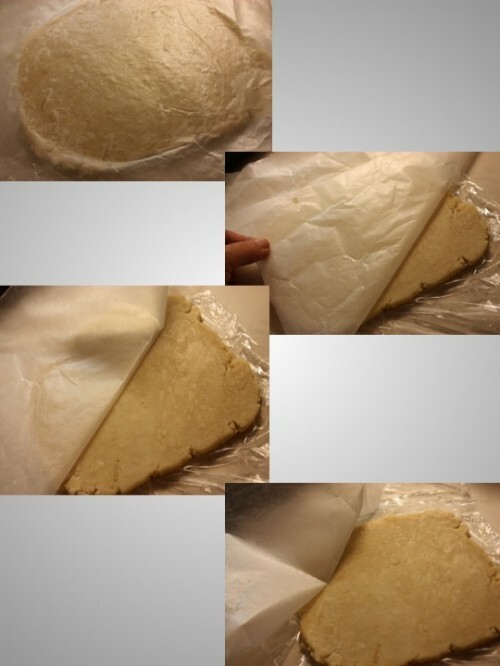 Remove dough from refrigerator and roll until 1/8 inch thickness. I like to roll the dough out in the plastic wrap as it helps the dough keep its form a bit easier and is also less of a mess to clean up. When it is nearly the size I want it, I replace the top layer of plastic wrap with parchment paper to keep it from sticking without having to supplement with additional flour which would make the dough too heavy. Using a knife, or a pasta cutter, cut out square pieces of dough that are about the size of each dish when placed upside down on the dough. 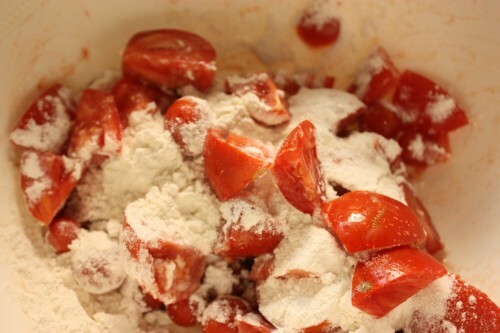 Each crust should be tucked in around the tomatoes to make a sealed pocket. In a small bowl, mix egg with 1 tsp water. Bush egg glaze over the crust and then sprinkle crust with remaining shredded Gruyère cheese. 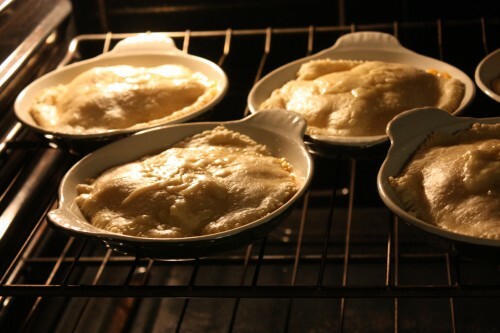 Bake approximately 35 minutes, until crust is golden brown and insides are bubbling. 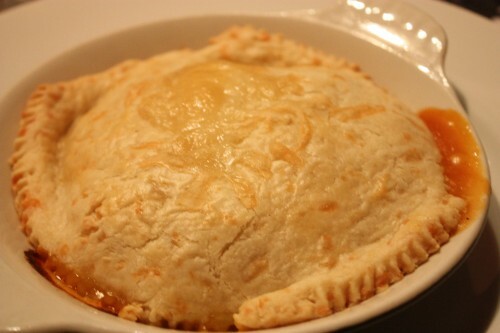 Resist temptation to eat this immediately and allow it to cool for 10 minutes so that the juices can properly set up – AND to ensure that no tongues are burnt when taking that first bite! 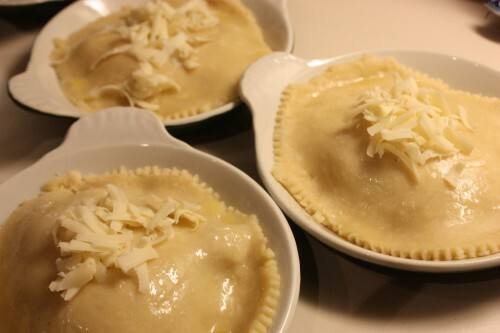 1) Any remaining dough can be frozen up to one month. 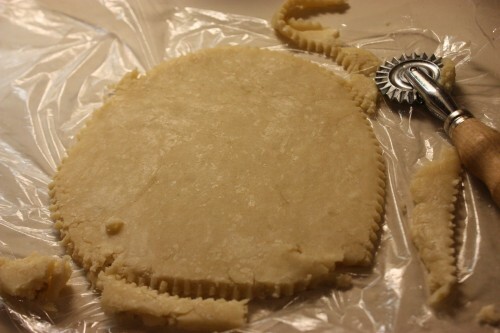 2) This dough also makes good crackers if you want to roll them out into cute shapes and serve with a nice cheese spread. 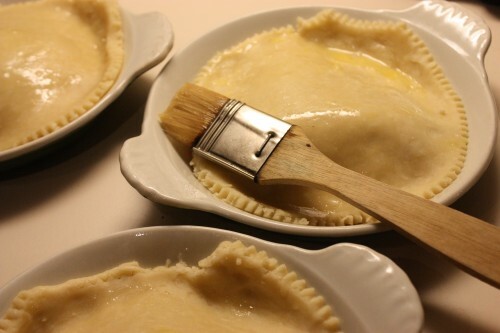 3) I like to make the crust a day before, to cut down on actual time in the kitchen, if you do this then you will want to bring the discs of dough to room temperature for 20 minutes before rolling out. 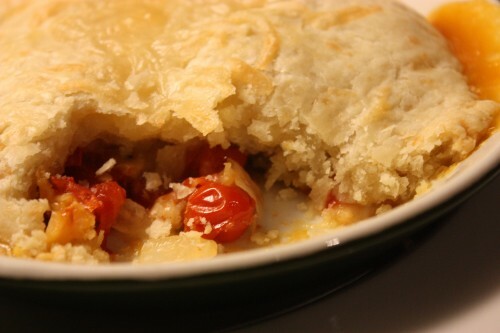 4) If you are pressed for time, you can make one large 9 1/2-10 inch pie but you will need to reduce the tomatoes down to 2 lbs total and increase the cooking time to 50-55 minutes.